This week, I’ve been working with my Bosnian colleagues to develop a campaign planning workshop series in Bosnia and Herzegovina for the fall of 2018. 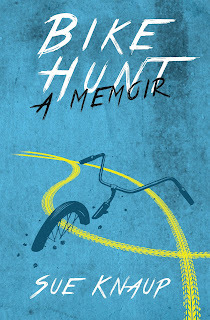 So, for the next in this series of excerpts from my recently published memoir, Bike Hunt, I’d like to share a story from the Balkans. George was a mistreated metallic-blue mountain bike I bought in Pula, Croatia before the annual general meeting of the European Cyclists’ Federation, which took place on the island of Veliki Brijun, a short ferry ride from Pula. George found his new home inland, in the city of Zagreb, thanks to my bike advocate friend Darinka. This was the first time I’d seen the Bike Hunt through someone else’s eyes. Enjoy. On my last afternoon, Darinka joined me for George’s giveaway. As we pedaled downtown and into an open square of mingling crowds surrounded by ornate buildings, I warned Darinka that sometimes the giveaway can be quite difficult, though I had no idea what we were in for. After nearly two hours of Darinka giving the spiel in Croatian to countless people as I played her sidekick showcasing George, we both slumped onto the edge of a fountain to regroup. Everyone we had approached was either too busy or already had a bicycle. We had just decided to make another full circle of the square when we both spotted the same man. “That is definitely him,” she said as we walked toward him as casually as possible. His sadness showed in his slow stride and slouched shoulders. I guessed he was in his forties, a worker with blue carpenter’s pants and short, dusty blond hair. He had sauntered out of the crowd on the edge of the square and was slowly making his way to the other side. Darinka caught his attention and began the spiel. He listened intently, looking slightly down at her. When she was done, he glanced over at me and George, then back to Darinka to ask careful questions. She started getting excited, explaining and pointing at George then pointing at him, showing him the bike would be all his. That’s when his face lit up and I swear he grew several inches as he turned to gaze at George. I pushed George into his hands and he pulled him close. Darinka went on talking as I fumbled for the key. I had to nudge him to pull his attention away from the bike and hand him the key, pointing to the lock. He took it as his face spread into joy and a tear formed in his eye. He sucked in some air and spoke to Darinka before throwing his leg over the bike and pedaling away. We both watched him disappear into the crowd and then Darinka sprang into a wild twirling dance around me. Watching the effect of the Bike Hunt giveaway through Darinka’s reaction, laughing and exclaiming along with her in the middle of that city of survivors, I could step back and see it, see why the Bike Hunt had become so essential to me. George’s Bike Hunt story is one of many throughout the book. I’ve got my eye on several more to share on this blog. All will have the label “Bike Hunt” so you can easily find them.